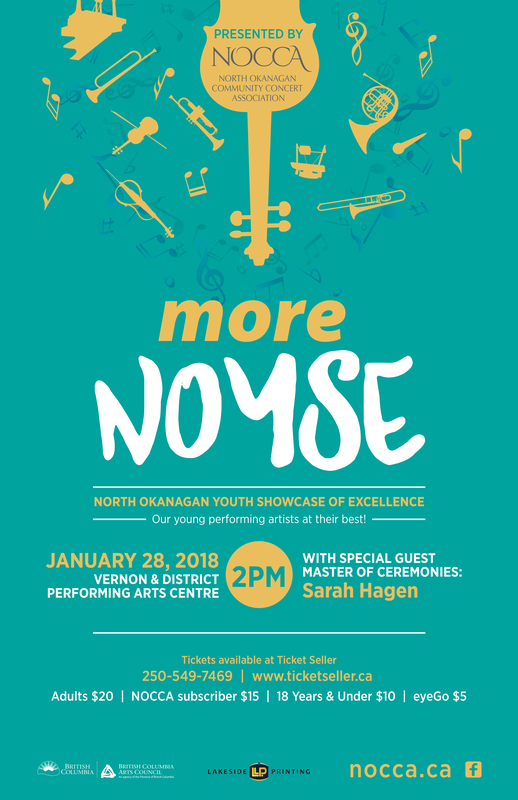 NOCCA is excited to support North Okanagan’s incredible young talent with a bi-annual North Okanagan Youth Showcase of Excellence (NOYSE) concert held at Vernon’s Performing Arts Centre. Singers and musicians from Lake Country to Salmon Arm, under the age of 25, preferably with Grade 10 or higher, are invited to audition for an opportunity to participate in this concert. Both soloists and small groups are welcome. Our goal is to present a variety of individual and ensemble performances, each being approximately ten minutes in length. The achieved grade level is not mandatory, but the ability to entertain and be comfortable doing so is an asset. We are looking for excellence in ability as well as a variety of programming. Classical presentations are preferred, but not exclusively. Honoraria for selected participants will be $300 for solo, $400 for duo and $450 for trios or larger ensembles. Those students not chosen to perform in the showcase concert may instead be selected to open for NOCCA concerts. Featuring Marcus Coetzee – violin, Jax Dolman – vocal, Jonathan Fraser-Monroe – dance, Inter Contemporary Dance Group from Accentz studio, Holly McCallum – cello, Shaughnessy O’Brien – guitar and vocal, Tiernen O’Keefe – dance, Brandon Schmor – piano, Jacob Soucy Quartet – trumpet, keyboard, bass & drums, and Libby Wyse – violin. Hosted this year by Sarah Hagen of “Morning Melodies” fame, More NOYSE promises to be an afternoon of outstanding variety and entertainment. Don’t miss this opportunity to support our young artists, and to hear and see how bright the future is for the performing arts in the North Okanagan! NOYSE concert tickets are $20 for adults, $15 for NOCCA subscribers, $10 for ages 18 and under, and $5 for High School students on the 8to12 Program. Seats are available on a first come-first serve basis. All proceeds will go to an education fund to provide ongoing scholarships for music students in the North Okanagan as they continue their musical careers.